First Prize: 2 Business Class Return Tickets to Bangkok, Shanghai, Tokyo, Hong Kong, Auckland, Adelaide. Third Prize: 2 Economy Class Return Tickets to Hanoi, Jakarta, Chiang Mai, Osaka, Gold Coast, Perth. 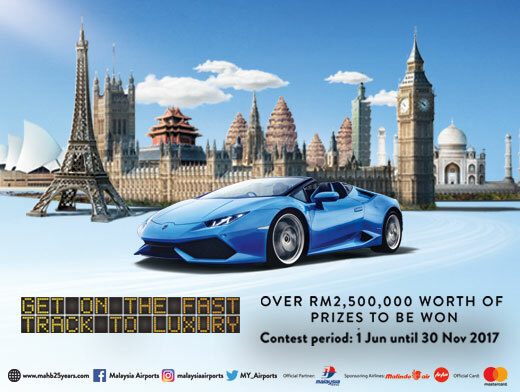 Collect the contest form at the cashier of the respective outlets or submission counters, fill the contest form and attach the receipts, and submit the completed form at the submission booths/boxes available in the participating airports. Note: Use Mastercard® to double your chances of winning. Visit MAHB 25th Anniversary Shopping Campaign page for more details. DON'T MISS OUT: Find out more how to get a FREE Super Mario toy! Yes, it is FREE!